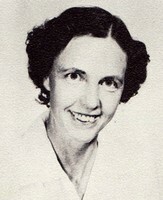 Juanita Ray Landers, daughter of James Jacob Ray and Mary Jane Cypert, married to Albert Wright Landers and buried in Dewey Cemetery, Lawn, Taylor County, Texas. Lawn Independent School District Cafeteria Custodian (1955-1957). Jim Ned Consolidated Independent School District First Group of Custodians (1957-1977). "Juanita Ray Landers, 94, died Friday, November 17, 2006, in a Coleman hospital. Services will be 2:00 p.m. Monday, November 20, 2006, in First Baptist Church in Lawn with Reverend Price Mathieson officiating. Burial will be in Dewey Cemetery, directed by Fry - Bartlett Funeral Home in Tuscola. Visitation will be 6:00 to 8:00 p.m. Sunday at the funeral home. "Juanita was born March 3, 1912 in Silver Valley to James Jacob and Mary Jane Cypert Ray. She married Albert Wright Landers December 23, 1933 in Silver Valley. A master chef, she liked nothing better than having her family gather to enjoy the favorite foods she always prepared. She worked twenty-five years in the school cafeteria in Lawn, retiring in 1976. She had many interests, but her main hobby was quilting. She grew up in a hard-working family and remembered learning to quilt sitting on a bucket to be able to reach the quilting frames. Her later quilts were works of art. Juanita was a happy, fun-loving, fiercely independent individual, and will be missed by all who knew her. She was a member of Lawn Baptist Church. "Preceding her in death were her parents, five brothers, four sisters, her husband and one daughter-in-law, Gayle Landers. "Survivors include four sons and daughters-in-law, Bobby and Rose Ann Landers of Georgetown, Wesley and Leda Landers of Fort Worth, Tommy and Betty Landers of Carrollton, and Clifford and Lorry Landers of Corpus Christi; two daughters and sons-in-law, Beth and Buddy Card of McCamey and Betty and Mike Richards of Melbourne, Florida; thirteen grandchildren; eighteen great-grandchildren; four great-great grandchildren; several nieces, nephews; and many friends. "Memorials may be made to West Texas Rehabilitation Center, 4601 Hartford Street, Abilene, Texas 79605-9989 or Lawn Senior Citizens, P. O. Box 14, Lawn, Texas 79530."